Wax It! Waxing, Sugaring, Nails and Lashes Studio. The Studio was designed by the concept "color up your office". 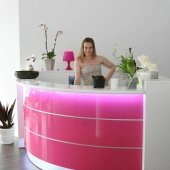 The round shaped reception desk fits to the complete white - pink furnishing and gives it a good watching spot. Wax it! Studio offers a wide range of beauty services in cologne. For online registered customers you got offered 50% discount. Grab it and wax it!